Four adventurous, recently qualified Stellenbosch students, Guy Robertson, Matt Hampson, Mark Hampson and Caiden Lang will form the core of the team completing the entire expedition. We are going to be filming a documentary of our expedition, which will be kayaking the circumference of Lake Malawi, roughly 1400 km, taking us two and half months. The aim of this expedition, is to inspire and challenge people to go out and make a difference in the lives of those around them, it challenges individuals to push themselves to achieve the impossible and by doing so make a difference. Mathew and Guy had the opportunity to come across an orphanage in Mbeya Tanzania called "Hope For The Future"during a backpacking trip in 2010, when a lady by the name of Sharmala, was kind enough to offer them accommodation. Sharmala runs a charity which has specific programs dedicated to assisting orphaned children e.g. the Inner-city Program. She herself takes care of 8 boys which lived with her in her small home and she looks after these children on minimal funding . Hope for the Future Ministries (HFM) is funded by donations from individuals, organizations, churches and schools. It is registered in Canada as Hope for the Future Ministries, and in Tanzania as Hope for the Future Foundation. All donations go directly to the implementation and operation of its programs. 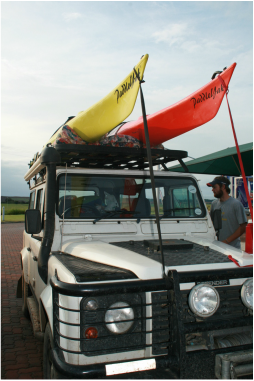 As we are paddling on Lake Malawi, we think it only right to support a Malawian charity as well. We have been in contact with Sandy Wynne-Jones who over-sees the All Angels school so we will also be raising funds for this worthwhile cause in Salima village, Lake Malawi. 1. To complete the expedition and overcome all logistical obstacles along the way. 2. To raise funds and awareness for our charities. We believe that our documentary will create a lot of interest and will be easily marketable. The proceeds of the documentary will be distributed to the projects involved. 3. To inspire others to challenge themselves to do something meaningful with their lives while they are still young and have the opportunity to do so. 4. To give our sponsors as much as possible in return for their contributions, and to increase the recognition of their brands via exposure from our expedition.